This is something I make quite often (well when I can find thin cuts of beef on sale). It’s really easy, is very kid-friendly, and is fab for leftovers. Mix together soy, vinegar, honey, chili bean sauce. Place beef in marinade and cover with plastic wrap for 15 minutes. Make rice. Add water, rice and olive oil to a pot. Stir and turn on high heat. When rice comes to a boil stir and reduce to low heat. Cover and cook for 15 minutes or water is gone and rice is fluffy. (Tip: Fluff your rice with a fork NOT spoon. A spoon will mash the rice together making it more dense. Fluffing with a fork adds air. While your rice is cooking, cut your scallions in half. 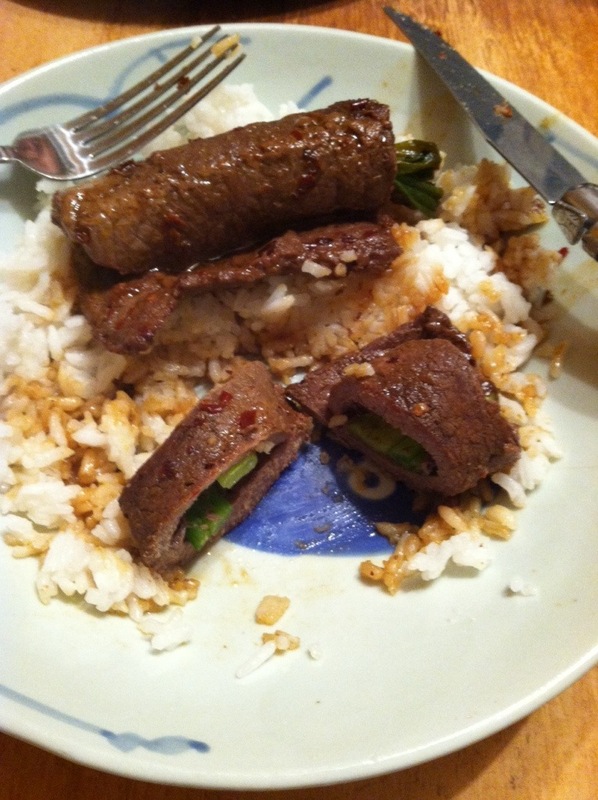 Take your beef out of marinade and slice by slice, roll scallions into beef. Add marinade to sauté pan and on low heat place beef/scallion rolls, open side down to seal. Cook for 8-10 minutes depending on the thickness of your beef, turning once with tongs to cook evenly. Serve with rice and sauce.